the land looks like a fairy-tale." This expedition offers the essential experiences of the wildest and most fantastic place on Earth. The cruise begins in the city of Ushuaia – the southernmost city in the world. Next, we cross the Drake Passage on your way to the South Shetland Islands and the Antarctic Peninsula. On the return journey, you will have the opportunity to catch everything you missed the first time around. Please Note: some departures may be a day shorter or longer, please contact us for more details. 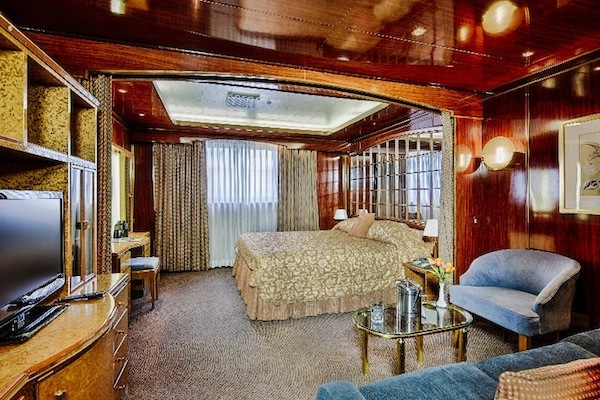 Averaging 21 square metres/226 square feet, these staterooms have two twins and a comfortable sofa bed. The twins also convert to a King, if desired. Located on Oceanus Deck, these suites have a picture window, two wardrobes and en suite facilities. Amenities include: in-room safe, refrigerator, satellite telephone access, TV/DVD, individual temperature control, and hair dryer. Averaging 23 square metres/248 square feet, Main Deck cabins are equipped with either two twins or a King Size bed. They are located on the Main Deck with a minimum of two portholes for exterior views. Amenities include: en suite facilities, in-room safe, refrigerator, satellite telephone access, TV/DVD individual temperature control and hair dryer. Averaging 21 square metres/226 square feet, these cabins are located on the Oceanus Deck. They feature a picture window, two wardrobes and a choice of either two twin beds or a King Size bed. Amenities include: en suite facilities, in-room safe, refrigerator, satellite telephone access, TV/DVD, individual temperature control and hair dryer. Superior Suites are located on the Club Deck. Averaging 20 square metres/ 215 square feet, these cabins feature two twin beds or a King Size bed. The picture window overlooks an outside walkway on the Club Deck. Amenities include: en suite facilities, walk-in closet or wardrobe, in-room safe, refrigerator, satellite telephone access, TV/DVD, individual temperature control, hair dryer. The Deluxe Suites with balconies are located on the Sports Deck. Averaging 24 square metres/ 258 square feet means plenty of room. Choose from either two twin beds or a King Size bed. A sliding glass door leads to a private balcony. These suites feature a walk-in closet or wardrobe. Amenities include en suite facilities, in-room safe, refrigerator, satellite telephone access, TV/DVD, individual temperature control, and a hair dryer. The Premium Suites are located on the Sun Deck. Averaging a generous 30 square metres/ 323 square feet, with two twin beds or a King Size bed. Access the private balcony by a sliding glass door. Amenities include: en suite facilities, lounge area, in-room safe, refrigerator, satellite telephone access, TV/DVD, individual temperature control, and hair dryer. Super-spacious (43 square metres/ 463 square feet) elegant suite on the Sun Deck. Designed for entertaining, the Owner's Suite has a separate living room with game and meeting area. A BOSE stereo system provides background music, or watch videos on the HD plasma TV. Sliding glass doors lead to a private deck. Refresh in the jetted bathtub in en suite facilities. Slumber in the King Size bed. A sofa bed can accommodate a third person. Welcome to Ushuaia, the world’s southernmost city and starting point of our expedition. Upon your arrival at the airport we provide a transfer to your hotel, which has been arranged by us and is included in the price of the voyage. For the rest of the day you are free to explore the city. Take advantage of souvenir shopping and a variety of dining options in the city center. In the afternoon we provide a group transfer to the pier and welcome you aboard the luxury expedition ship M/V Sea Spirit. Explore the ship and get comfortable in your home away from home for the extraordinary adventure to come. Savor the anticipation of your Antarctic dreams coming true as we slip our moorings and sail toward a true wilderness where wildlife abounds. The scenery as we sail through the Beagle Channel on our first evening is wonderful and there is already the possibility of marine mammal encounters. After transiting the Beagle Channel and passing the islands of Tierra del Fuego, we head south across the Drake Passage. Pelagic seabirds including the majestic albatross are common in these waters and can readily be viewed from panoramic open decks or from exterior stateroom windows and balconies. On the way we cross the Antarctic Convergence, the biological boundary of the Southern Ocean. The ship’s stabilizing fins provide comfort in the event of rough seas. Briefings, orientations, and lectures from our expert staff prepare you for our arrival in Antarctica. This is expedition cruising at its most authentic. Our route and exploration opportunities in Antarctica are heavily dependent on weather and ice conditions. Our experienced captain and expedition leader decide the itinerary and continually adjust plans as conditions and opportunities warrant. We take advantage of long daylight hours to exploit every opportunity to experience excellent wildlife viewing, amazing scenery, and excursions via Zodiac. The Antarctic Peninsula region contains some of the world’s most impressive scenery and some of Antarctica’s best wildlife viewing opportunities. Protected bays and narrow channels are surrounded by towering mountain peaks covered in permanent snow and immense glaciers. Icebergs of every size and description complete an image of incomparable beauty. Waters rich with krill are home to a variety of whale and seal species. The whole area is alive with penguins foraging at sea and forming large nesting colonies at special places on land. The area is also home to Antarctic research stations of various nationalities. Some stations have a gift shop and post office. The South Shetland Islands are the northernmost islands in Antarctica and will likely be our first sighting of land. This wild and beautiful island chain contains numerous landing sites with abundant wildlife and historical significance. Among them is Deception Island, where the flooded caldera of an active volcano harbors an abandoned whaling station. Farther south, on the Antarctic Peninsula, the vast Gerlache Strait area contains sheltered bays, accessible wildlife, and stunning scenery. Places with names like Paradise Bay are the epitome of everything Antarctic: glaciated mountains, towering icebergs, feeding whales, seals on ice floes, and bustling penguin colonies. At the southern end of Gerlache Strait is the famous Lemaire Channel, also known as “Kodak Gap” because of the photogenic way the mountainous sides of the narrow channel are reflected in calm waters strewn with icebergs. Our days in Antarctica are filled with memorable excursions, sumptuous meals, presentations by our experts, and enough incredible scenery and wildlife to fill your camera and overwhelm your emotions. After our amazing time in Antarctica we cross back north through the bountiful waters of the Drake Passage. Presentations and workshops by our expert staff, as well as our range of onboard recreation facilities, ensure that these days at sea are not idly spent. This is also the time for our End of Voyage ceremonies including slideshow and farewell dinner. After breakfast we say farewell in the city of Ushuaia, where we started. We provide a group transfer to the airport or to the town center if you wish to spend more time here. As you look back on your wonderful experience in Antarctica, you may already be looking forward to your next incredible adventure to the ice! Itinerary, landings and all other activities during the cruise depend strongly on ice and weather conditions and are subject to the decisions of the Expedition Leader and the Captain of the vessel. Encounters with any mentioned wildlife cannot be guaranteed. There is a lounge, bistro and bar, hot tub, gym, a state-of-the-art presentation room and stabilisers for smooth cruising. Smallest suite is a spacious 215 square feet. Owner's Suite is an outstanding 550 sq. feet. Some cabin plans may vary depending on the cruise, please check for details. Next departure on 29 November, 2019. Rarely visited today yet significant in the history of polar exploration, Franz Josef Land is worthy of its legendary reputation. 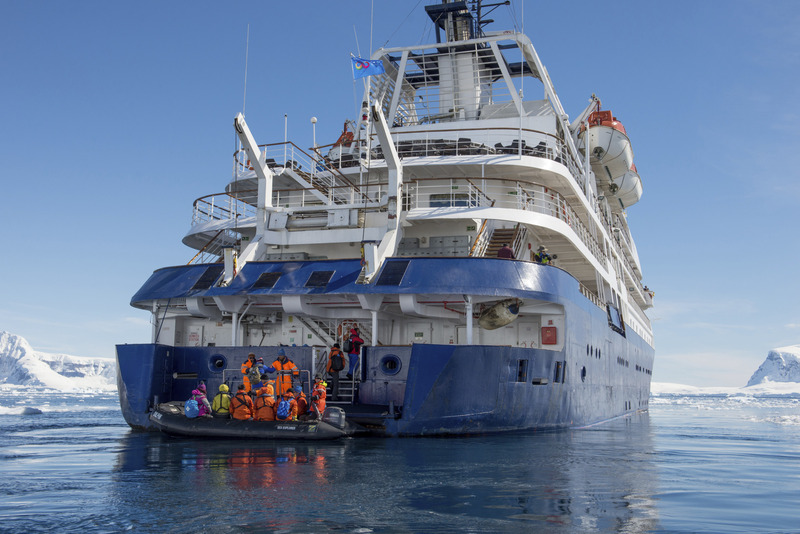 This extraordinary expedition to Franz Josef Land is as unique ......click here to read more. There are many reasons why adventurers of all types travel to Antarctica. Most of us are inspired by the opportunity to experience unique wildlife—penguins, seals, whales—going about their lives in ......click here to read more.